“Ramapo was where I first cultivated my supportive, professional community and, along the way, met two of my best friends, Victoria Fernandez and Shalayne Cupolivo. I was introduced to encouraging faculty including, but not limited to, Pat Chang, John Yao, Ed Shannon and Monika Giacoppe. Ramapo also gave me my first experience out of the U.S. with the Ireland Study Abroad program, and my first management experience as Manager of the Information Systems Office.” – Anna Coats ’05 graduated with a degree in Literature. Since graduating, Anna moved to and lived in Japan for two years where she taught English, earned an M.A. in English from Rutgers-Newark and an M.S. in Library & Information Systems from the University of Illinois, Urbana-Champaign. 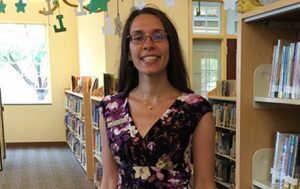 Anna is currently Head of Youth Services at Livingston Public Library and stays active in the American Library Association (ALA) and the Asian Pacific American Librarians Association (APALA). Anna has received the following awards: the 2015 ALSC Creativity Creates Grant, the 2015 N.J. State Library Multicultural Programming Award, the 2015 ALA Emerging Leader, the 2013 REFORMA NE Chapter Professional Development Award and the 2012-2013 NJLA Emerging Leader.